It was spurred by the increase in residential and industrial listings, as well as mortgagee sales put up by banks. Total auction listings jumped 35% YoY to 1,088 (including re-listings), according to Colliers International. For H2 2018, properties put up for auction climbed 40% HoH and 47% YoY to 634 listings. The research firm noted that the growth in listings was spurred by the increase in residential and industrial listings, as well as properties put up for mortgagee sales by banks. In 2018, 2 in 5 (43%) or 472 properties were mortgagee listings,up 27% from their figures in 2017. On the other hand, owners’ listings climbed 43% YoY to 616 listings. According to Tricia Song, head of research for Singapore, Colliers International, mortagee listings increased gradually in the last five years, possibly stemming from the bull run in the market in 2011, 2012 and 2013 where some buyers might have snapped up units at elevated prices, and subsequently found themselves unable to service the mortgage payments. 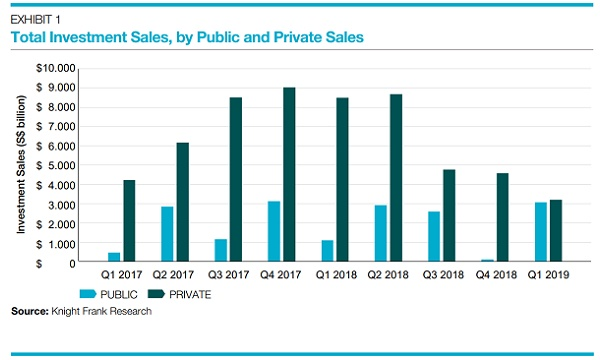 “This year, we expect property auction listings – both owners’ and mortgagee listings - and sales to grow as cooling measures continue to bite for the residential segment and more owners putting up non-residential properties for sale,” Song noted. 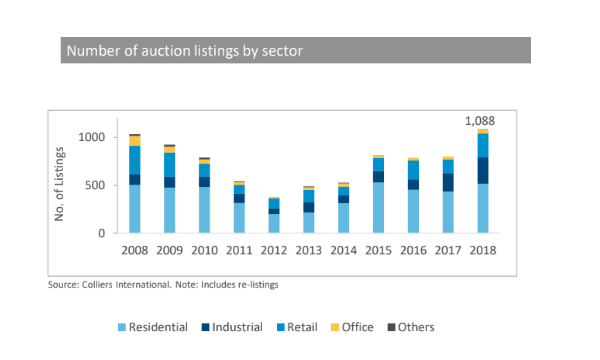 Despite growth in the number of listings, sold properties via auction crashed 27% YoY to 35 properties as only 14 properties were sold via auction in 2018. Total aggregate value of auction sales in 2018 plumetted 52.43% to $51m from $107.2m in 2017. “We notice that the success rate of properties sold at auction dropped from 6.0% in 2017 to 3.2% in 2018, reflecting investors’ cautious approach and a widening price gap between buyers and sellers,” Steven Tan, director of capital markets & investment services at Colliers International, said.